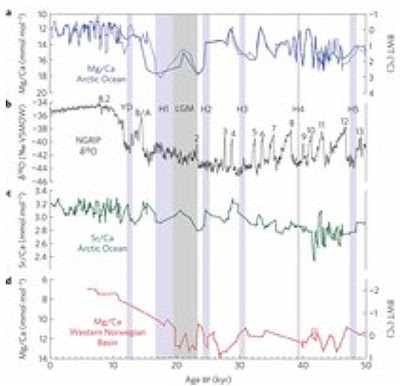 A new paper published in Nature Geoscience finds "From about 50,000 to 11,000 years ago, the central Arctic Basin from 1,000 to 2,500 meters deep was ... 1–2°C warmer than modern Arctic Intermediate Water." This finding is particularly surprising because it occurred during the last major ice age. Horizontal axis is thousands of years ago with modern temperatures at the left and 50,000 years ago at the right. Temperature proxy of the Intermediate Water Layer of the Arctic Ocean is shown in top graph with degrees C anomaly noted at the upper right vertical axis. Note this graph is on an inverse scale with warmer temps at the bottom and colder temps at the top. T. M. Cronin, G. S. Dwyer, J. Farmer, H. A. Bauch, R. F.
halocline through past climate variations is unclear. contribute to the intermediate depth warming. 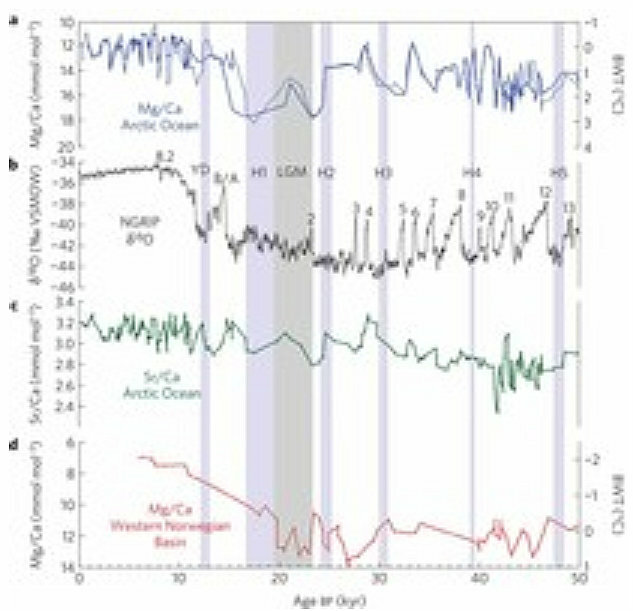 events and the Younger Dryas cold interval. Is it a driver melting the ice or is it harbinger of drastic cooling?